For all this, Judas’ name is synonymous with betrayal, and Dante, in Canto XXXIV of his “Inferno,” places him in the very lowest circle of Hell, being devoured eternally by a three-faced, bat-winged devil. Virtually every image we carry about Judas comes from Dante or a later artistic portrayal of the man – e.g., reddish hair color (Harvey Keitel in “The Last Temptation of Christ”) or his fiery disposition (“Jesus Christ Superstar”). There has been a lot of energy spent on trying to interpret meaning based on Judas’s last name, “Iscariot.” There are four main theories about the name. It is derived from Judas’s membership in the sicarii, or “dagger wielders,” a band of religious terrorists of the time. In this speculation Judas was aligned with the Zealots.. But, as Meier notes, the sicarii did not emerge until around 40 or 50 A.D., well after the death of Jesus of Nazareth. Also, if Judas was a sicarius, then it would have been likely that he would have assassinated Jesus by stabbing him in a crowd rather than handing him over to the authorities. The name Iscariot is comes from the Semitic root verb sqr, meaning “to lie.” But Judas is not portrayed as a liar but a betrayer. Perhaps it is a link to a Semitic word describing the man’s occupation, a red dyer, or a reference to his supposed reddish hair color. Iscariot may refer to a place of birth, a village named Keriot in Judea. Therefore he would be, in Hebrew, “a man from Kerioth” (‘ish qeriyyot). In this construct Judas would have been the only apostle not from Galilee, making Judas an obvious outsider among the Galilean apostles. Unfortunately, it is not clear that a town called Kerioth ever existed. But why did Judas do it? What was his motivation? As a starting point, we should see what Scripture has to say. 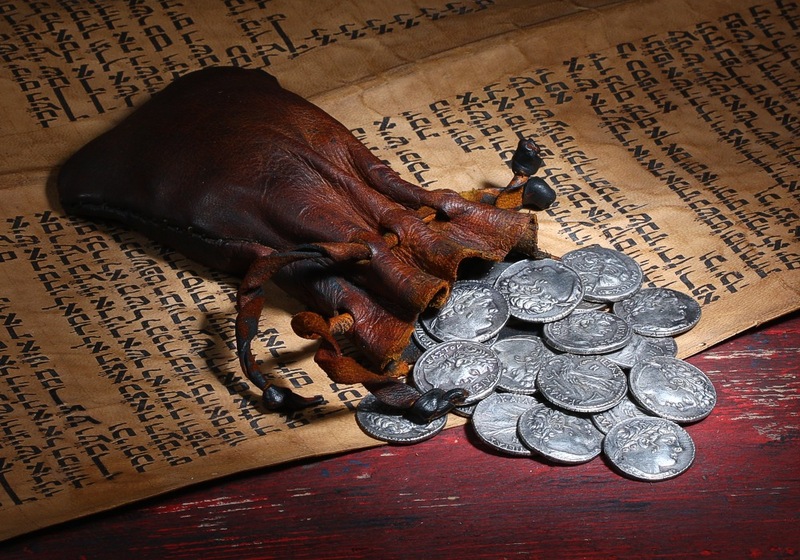 The Gospel of John parallels the avarice theme depicting Judas as a greedy keeper of the common purse. Foe example, right before his crucifixion, when Jesus is anointed with costly fragrant oil by a woman in the town of Bethany, Judas complains asking why the money was not given to the poor. As an aside, John comments “He said this not because he cared about the poor but because he was a thief and held the money bag and used to steal the contributions.” It should be noted that this was written 60-70 years after the event. Confusing things even further, John has Jesus telling Judas at the Last Supper, “What you are going to do, do quickly” (John 13:27) implying a bit of coercion on Jesus’ part. Some scholars have toyed with the idea that Judas is a fictional character invented as a plot device in order to lay the blame for the crucifixion on the Jewish people. But this wholesale invention is unlikely. By the time the gospel accounts were reaching final written form (from their oral tradition beginnings) the Christian community would have still counted among its members those who were friends of Jesus, who were eyewitnesses to the Passion events, or who knew the sequence of events from the previous generation. All these would presumably have criticized any wild liberties taken with the story. The story of one of the apostles, Judas, betraying Jesus was a known and most embarrassing fact. Something to erased from the record not invent. Overall, though, none of the four Gospels provides a clear or convincing reason for why one of the inner circle of disciples would betray the teacher he esteemed so highly. Greed, for example, fails miserably as an explanation. After all, why would someone who had travelled with the penniless rabbi for three years suddenly be consumed with greed? One Scripture scholar, the late William Barclay, professor of divinity at Glasgow University, and author of the widely used Daily Study Bible series, suggested that the most compelling explanation is that in handing Jesus over to the Romans, Judas was trying to force Jesus’s hand, to get him to act in a decisive way. Perhaps, he suggests, Judas expected the arrest would prompt Jesus to reveal himself as the long-awaited Messiah by overthrowing the Roman occupiers. When Judas’ plan goes terribly wrong, this offers a better sense of explaining why Judas would have been so shattered after the crucifixion that he committed suicide. In other words, only if Judas had expected a measure of good to come from his actions would suicide make any sense. It is truly sad that Judas did not persevere to see the incredible measure of good that came from Jesus’ action. It is the pitfall of being “spy.” From the shadows you think you see it all, but it is only in the light that the truth can be known. This entry was posted in Scripture and tagged betrayal, Judas, Spy Wednesday by Friar Musings. Bookmark the permalink.